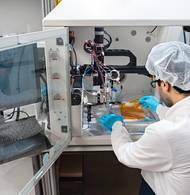 Researchers at the Technische Universität München (TUM) are showing the way toward low-cost, industrial-scale manufacturing of a new family of electronic devices. A leading example is a gas sensor that could be integrated into food packaging to gauge freshness, or into compact wireless air-quality monitors. New types of solar cells and flexible transistors are also in the works, as well as pressure and temperature sensors that could be built into electronic skin for robotic or bionic applications. All can be made with carbon nanotubes, sprayed like ink onto flexible plastic sheets or other substrates. Carbon nanotube-based gas sensors created at TUM offer a unique combination of characteristics that can't be matched by any of the alternative technologies. They rapidly detect and continuously respond to extremely small changes in the concentrations of gases including ammonia, carbon dioxide, and nitrogen oxide. They operate at room temperature and consume very little power. 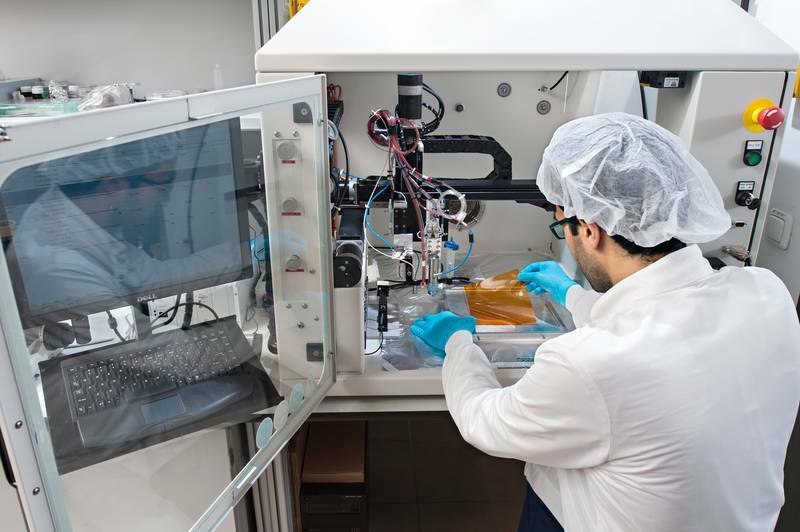 Furthermore, as the TUM researchers report in their latest papers, such devices can be fabricated on flexible backing materials through large-area, low-cost processes. Thus it becomes realistic to envision plastic food wrap that incorporates flexible, disposable gas sensors, providing a more meaningful indicator of food freshness than the sell-by date. Measuring carbon dioxide, for example, can help predict the shelf life of meat. "Smart packaging" – assuming consumers find it acceptable and the devices' non-toxic nature can be demonstrated – could enhance food safety and might also vastly reduce the amount of food that is wasted. Used in a different setting, the same sort of gas sensor could make it less expensive and more practical to monitor indoor air quality in real time. 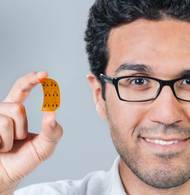 Not so easy – but "really simple"
Postdoctoral researcher Alaa Abdellah and colleagues at the TUM Institute for Nanoelectronics have demonstrated that high-performance gas sensors can be, in effect, sprayed onto flexible plastic substrates. 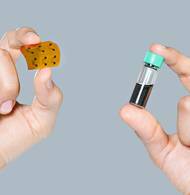 With that, they may have opened the way to commercial viability for carbon nanotube-based sensors and their applications. "This really is simple, once you know how to do it," says Prof. Paolo Lugli, director of the institute. The most basic building block for this technology is a single cylindrical molecule, a rolled-up sheet of carbon atoms that are linked in a honeycomb pattern. This so-called carbon nanotube could be likened to an unimaginably long garden hose: a hollow tube just a nanometer or so in diameter but perhaps millions of times as long as it is wide. Individual carbon nanotubes exhibit amazing and useful properties, but in this case the researchers are more interested in what can be done with them en masse. Laid down in thin films, randomly oriented carbon nanotubes form conductive networks that can serve as electrodes; patterned and layered films can function as sensors or transistors. "In fact," Prof. Lugli explains, "the electrical resistivity of such films can be modulated by either an applied voltage (to provide a transistor action) or by the adsorption of gas molecules, which in turn is a signature of the gas concentration for sensor applications." And as a basis for gas sensors in particular, carbon nanotubes combine advantages (and avoid shortcomings) of more established materials, such as polymer-based organic electronics and solid-state metal-oxide semiconductors. What has been lacking until now is a reliable, reproducible, low-cost fabrication method. Spray deposition, supplemented if necessary by transfer printing, meets that need. 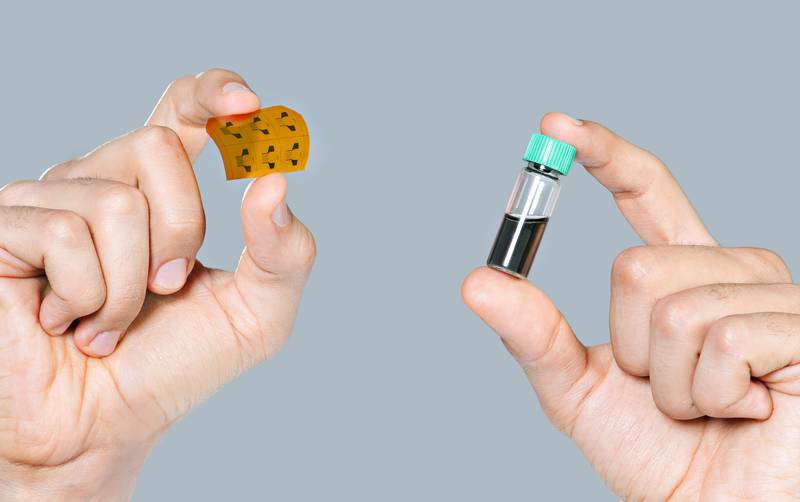 An aqueous solution of carbon nanotubes looks like a bottle of black ink and can be handled in similar ways. 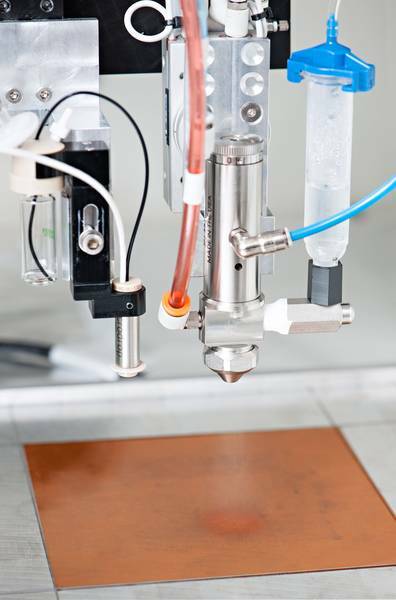 Thus devices can be sprayed – from a computer-controlled robotic nozzle – onto virtually any kind of substrate, including large-area sheets of flexible plastic. There is no need for expensive clean-room facilities. 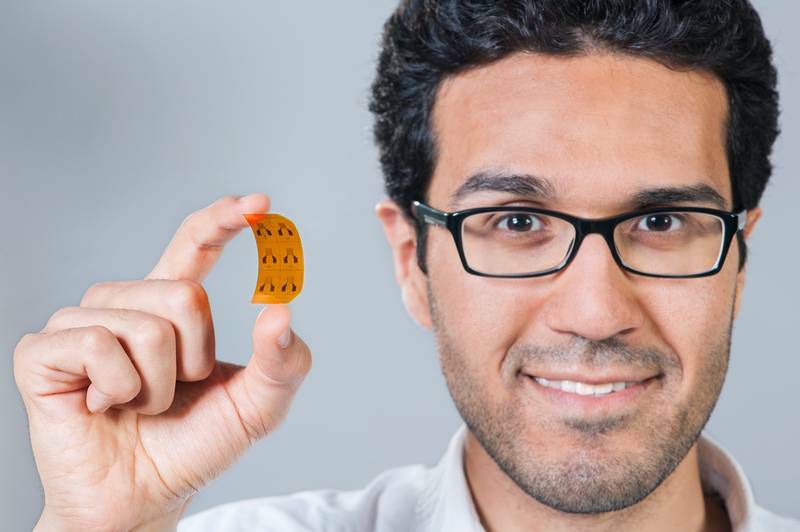 "To us it was important to develop an easily scalable technology platform for manufacturing large-area printed and flexible electronics based on organic semiconductors and nanomaterials," Abdellah says. 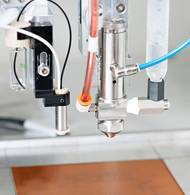 "To that end, spray deposition forms the core of our processing technology." Remaining technical challenges arise largely from application-specific requirements, such as the need for gas sensors to be selective as well as sensitive. This research was partially supported by the German Research Foundation (DFG) through the Cluster of Excellence Nanosystems Initiative Munich (NIM), and by the Bavarian State Ministry for Science, Research and the Arts under the initiative Solar Technologies Go Hybrid. Flexible carbon nanotube-based gas sensors fabricated by large-scale spray deposition.